Step up to the plate for big cash prizes. Batter up! 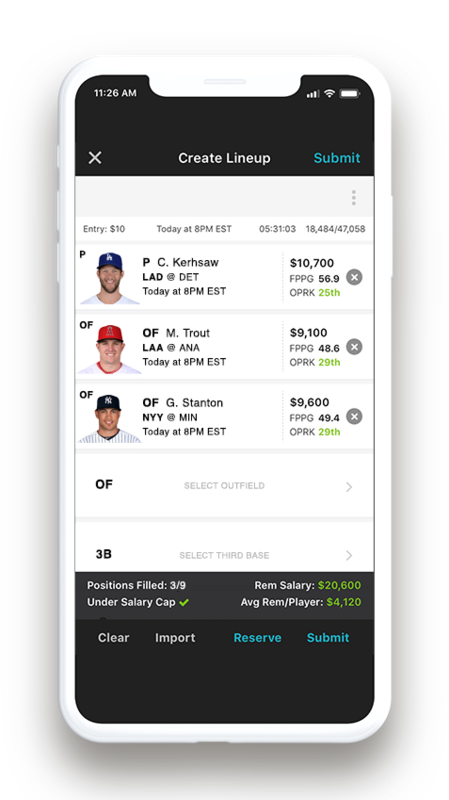 It’s time to get closer to the game of baseball than ever before with DraftKings daily fantasy baseball. Draft a lineup of two pitchers and eight batters while staying within the salary cap. When your players make plays on the mound or at the dish, you score points. Point categories include things like hits, RBI, runs scored and homers. Pitchers get points for outs recorded, strikeouts and more. The more points your rack up, the higher you’ll climb on the leaderboard and the bigger cash prizes you’ll win. And just like baseball, every day is a new day — except in our game you draft a new team whenever you want. Create an account today and get in the daily fantasy baseball action for free. It's easy to play DraftKings daily fantasy baseball. Choose a contest and draft from all of baseball’s superstars. Score big and win big. How is daily fantasy baseball on DraftKings better? Reasons you should get on the diamond with DraftKings. Draft a new team whenever you want. Makes every single pitch way more exciting. Play daily fantasy baseball contests for as little or as much as you want. There’s a daily fantasy baseball contest for everyone — you can even play free. Scoring is based on how your players performs in games. Learn more about fantasy baseball scoring.